I have two weddings to attend this year, and I am really looking forward to them. For a couple of years Rob and I were invited to about ten weddings in a year, it was intense but I have come to discover how much I enjoy a good wedding. The marriage rush is a bit more spaced out now, which is good because I imagine attending a wedding with a baby is going to be a whole different experience! The latest invitation arrived on Sunday and it is so beautiful I had to share it with you. And whilst I was showing you the beautiful stationary I may as well include my new shoes that I think are going to be ideal for wedding season. They pass my wedding shoe checklist; pretty, neutral enough to go with different outfits, a heel tall enough to look good but small enough to not murder my feet before the speeches start! Always have a full English breakfast to start the day. Weddings are intense days and sometimes lunch time gets overlooked as you are often travelling to the venue or are at the ceremony. Look good but be comfortable. If you have to tug the dress up or the skirt down every two minutes you are in the wrong outfit. It’s easier to have a good time when you are comfortable and confident in what you are wearing. Bring snacks in the car. The reception can easily be delayed if the photos overrun so have a bag of emergency snacks and a bottle of water in the car, just in case! Go for a walk in between the afternoon reception and the evening celebration. This is the most likely time of the day that you will suffer wedding fatigue, so leave the bar for a bit and have a wander around the grounds. If you are staying overnight at the hotel, now is a good time to go to your room and have a little chill out time. Then come back ready to dance the night away! Don’t be shy when it comes to getting cake or stuck in the evening buffet. Everyone tends to wait for everyone else, but just lead the way and dive in, trust me you will be hungry! Make sure that you tell the Bride and Groom and their parents what a great day you are having. A lot of work goes into a wedding and even though it is ‘their day’ the happy couple will have put a lot of thought in to how to give their guests a good time. They will enjoy their day a whole lot more if they know you are enjoying it too! A friend introduced me to the concept of Bible Journaling over the weekend, and it looked fun so this week’s memory verse comes all spruced up for you! Not bad to say that I managed to do this on a day when Orla would not nap or go no longer than ten minutes without needing a cuddle! I have no penmanship at all so Bible journaling may prove to be a challenge in the long run! It has got me thinking how people do have a deep desire for things to be fair; to be right. We want there to be justice in the world and we are wounded deeply when we fail to get justice, whether that is in the form of getting the blame for another person’s failure at work, or dealing with spiteful rumours after a bad break-up. When we know someone has lied and gotten away with it, it cuts us up inside. When victims of crime fail to receive justice they can fall into depression, and sometimes the wrong person altogether pays the price for another’s crime. Justice matters, righteousness matters, but in this world it often falls short of what we need. There are some crimes that will never be solved, some criminals who will never face a judge, some wrongs that will never be made right. And that hurts us. We don’t just want justice, we hunger and thirst for it. When we hunger and thirst for food and water our bodies suffer, when our souls hunger and thirst for righteousness our spirits suffer. But Jesus promised that those who hunger and thirst for righteousness will be satisfied, and I wonder, if the Beatitudes are a Gospel in summary, as I believe they are, does this verse refer to Judgement Day? Judgement day is the day when God will bring mankind to account for all of their deeds, both good and bad. It is often used in a negative light to try and scare people into being good, but there is another side to this key point of theology too. Judgement day is the day when all the crimes will be solved, all criminals will face the truth of what they have done, all wrongs will be made right. It will be a day of perfect justice for everyone. Then the scary thought becomes ‘would I be able to stand on a day of perfect justice?’. But that is a verse for another week! For now I want to focus on that whilst some days I may feel helpless to get what is right, in God there is hope for true, eternal, nourishing righteousness for everyone who is hungry for it. I’ve only managed to finish one book since my last Book Bag post…and technically it isn’t even a book but a comic! But it is a very good comic so into my virtual book bag it goes! The 12th volume in the best-selling, award-winning FABLES series collects the epic from issues #76-82 of the acclaimed monthly series. If you’ve ever craved a guided tour of Fabletown’s secret Manhattan location, prepare to be thrilled. Pinocchio has a field day taking a certain VIP around the city. And exactly which Fabletown denizens are no longer active (dead, alive or otherwise) just might shock you into a comic book coma. Also in this volume, you’ll find the 4-part story featuring Freddy and Mouse, two local rogues who just want to get along and perhaps turn a bit of profit in the post-war, topsy-turvy world. Meanwhile, in Fabletown, a new political group forms called the Society of Seconds, and what they want doesn’t seem very reasonable at all. I am twelve volumes in now with this Comic Book series and I love it more than ever. The story just gets richer and richer with each tale; the characters are deeper, the stakes are higher and the comedy is gold. This page had me laughing out loud as six shape-shifter spies set off in to the jungle. Nothing wrong with being a duck! Nothing at all! 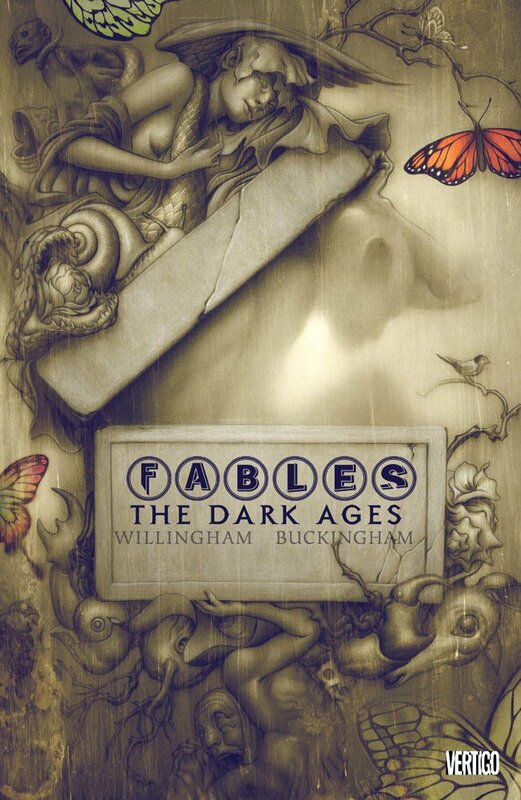 If anyone wanted to start reading comics but didn’t know where to start I couldn’t recommend Fables enough, with all the fairy tale links it is really accessible. Like Once Upon a Time with espionage and a faster moving plotline. I have volume 13. all ready to go on my bookshelf but I think I am going to finish another book first before I dive back in to the Fable world. I adore this quotation from Pollyanna. I think Pollyanna as a book has fallen out of favour, it is a bit sickly sweet for some, but I think that at it’s heart it has a good message; that it is better for us to seek out the good in situations, and that is is especially important to see and talk up the good we can see in other people. Expectations have a powerful impact on how people behave. If a child is told repeatedly that they are naughty they continue to misbehave. If a coach tells a player that they can make the shot, they are more likely to make the shot. If we give voice to the good attributes we see in our friends and family the more likely they are to excel in those attributes. I have a couple of friends who are very good at this, whenever I see them they make me feel proud of myself. They see the best in me and make me feel like I can achieve the things I want to achieve. That is the kind of friend I want to be to other people and it is definitely the kind of parent I want to be to my little Orla! So, that’s my challenge this week, to talk up the good I see in people and be a better encourager! Week three of my Beatitudes memory verse challenge. Here is one that always reminds me of Little Shop of Horrors! But ‘inherit what?’ is the pertinent question. Jesus said that the meek will inherit the earth. I think that Jesus is alluding that one day there will be a great change of power. An old order will pass away and something new will arise instead. This is what is promised in more detail in Revelation; a new heaven and a new earth that will not be ruled by the people with the most strength or those who were born fortunately wealthy. Instead authority will belong to those who have lived a life of humble serving love, to those who will only use leadership to lift others up instead of pushing them down. I think this verse is a summary of this great promise. I feel like I am getting to know these words afresh by doing this memory verse challenge. It’s a good way to liven up your approach to the Bible, especially if you have been reading it a long time! One surprising thing about becoming a mum is the early pressure on babies to have an active social life. There are play sessions and baby massage at the Children’s centre, Mums &Tots groups at Church, baby swimming lessons and yoga sessions at the leisure centres…there is a lot going on! I have to admit I found the choices and expectations too much at first. I was exhausted and wiped out from sleepless nights, and my baby was grumpy and colicy. It was just not the time for socializing! However, things changed. We both get more sleep now and Orla is passed the colic stage. So we have been going along to a couple of groups and I want to tell you about one that really works for us. Hartbeeps is a Sensory, musical play session. There are classes for different ages and we have been going to the Baby Bells session for newborn to sitting age. So here is how it works. The room is set up with a big green grass rug in the middle, on which there are a number of intriguing props, toys and lights. Around the edge of the rug are mats for the babies and cushions for mums to sit on. The leader then sets the music to play and she leads through a series of gentle games and activities. Some of them are based on nursery rhymes, some tell a story and most involve cool props like light-up stars or feather bowers! It only lasts around 40 minutes which is just long enough for Orla to enjoy without getting overtired. Because the session is full of things to do it is a good place to go even if you don’t know anyone else there. You’re not forced to make awkward conversation but have space to relax into it. It’s taught me some great games to play with Orla at home. She really likes the Hartbeeps version of ‘Row, Row, Row your boat’! Orla also loves the sensory aspects such as holding feathers, the bubble machine and all the moving lights. It has a really calm atmosphere and you are made to feel comfortable to stop if you need to feed the baby or change a nappy. There are dress up elements too that leads to extra cuteness! Orla is much more likely to have a nap after Hartbeeps which is always a winner! If you live in Lancashire and are interested you can find out more for yourself here. I am into my second week of memory verses from the Beatitudes. Last week I noted that Jesus’ first blessing was for those who need Him, and now that I look at this passage again I see once more that Jesus’ blessings are for those in need. In one way it looks all backwards; ‘Blessed are the poor in Spirit…Blessed are those who mourn…’ I have mourned, it doesn’t feel blessed at the time. When I was 21 my very close friend, Rachel, passed away from a brain tumor. It was horrific. We had been friends since we were babies, we saw each other every week, we lived out of one another’s homes. And then she was gone, and I couldn’t reach her any more. She was missing, is missing. There is so much of my life that I wish I could have shared with her. She never met Rob or Orla. I carried her necklace in my bouquet when I walked down the aisle but I would have given the world to have her walk with me. Orla will not know her Aunty Rachel and I will not get to be Aunty Cathy to her children. Death is just wrong. We know this, we feel it, that’s why after thousands of years of people living and dying, it still cuts us to the core. In our heart of hearts, we believe it shouldn’t be like this. And I believe that inner rejection of death is a seed of hope God has planted in our hearts. Rachel passed away on a Sunday at our local hospice. That evening our church abandoned our normal service and Rachel’s family and friends, and church family met together. We wept, held one another, prayed and sang songs of worship and hope. And that night, as horrible as it was, I was comforted. As weird as it feels sometimes to say it out loud, I do believe in eternal life. I believe that one day dead broken bodies will be replaced with whole new ones, I believe I will have a day of reunion with Rachel. And I believe it is Jesus who gives me this hope that brings comfort and strength, right into the depths of my mourning. The baking impulse has struck again. This was a quick and easy recipe that still took me all day to do because I squeezed it in around baby care, (five months old and still does not nap!). The recipe for Crunchy Jumbles biscuits is in the Cook’s Encyclopedia of Baking by Carole Clements, which you can find here on Amazon. This book also has my favourite recipe for chocolate chip brownies, which is a blog post for another time! Like I said, this is a very easy recipe, sugar, butter, eggs, flour all mixed together with the good old Kenwood. Then I got to do the fun bit of adding in a mound of rice crispie cereal and chocolate chips. There really was a lot of rice crispies, in fact if I were to do the recipe again I think I would reduce the amount of rice crispies and increase the amount of chocolate chip -more gooey, less crunchy! Here is how the mixture looked before being spooned out on to the baking trays – and yes I may have had a smidge of the batter before it went in to the oven, just for taste testing purposes, of course! As I was in a hurry to get these into the oven, (Orla was getting grumpy!) I made no effort at all to get regimented sizes or shapes. Fortunately for me, these biscuits suit a rustic appearance! They came out huge! I really should start doing smaller portions on the baking trays. Ah well, if you’re going to have biccy might as well make it a big one! I really love the golden colour they turned in the other, and some of them still were a bit gooey in the middle, which I love! And the taste is quite nice too, they taste kind of oaty and syrupy – even thought they don’t have syrup or oats in them! Perfect to have as a supper treat with a glass of milk! I bet those words were a breath of fresh air to those listening. In those time the religious leaders had piled rule after rule on the people. The laws were fastidious, time consuming and frustrating. They were a heavy burden of guilt, constantly reminding people that they were not good enough. Then Jesus comes on the scene and says that the kingdom of Heaven is for those who are poor in Spirit, it’s for those who are lacking, those who don’t make the mark. This verse tells me that Jesus is there for the people who need Him. That His first thoughts are for the ones who need him most; people who get it wrong… People like me! Have you seen it? The bizarre advert with the smiley lady explaining why it is so important that women are beach ready ‘down there’? Because, who knows when you might be pulled into a skinny dipping situation at a party! And he is exactly right. I am glad I am old enough now and secure enough to know this advert is talking rubbish but many younger and more vulnerable women aren’t and it is just wrong to play on women’s insecurities (or to create new insecurities) to make a profit. So here are my issues with the being ‘beach ready down there’ advert…. How I look ‘down there’ isn’t anyone else’s business. It’s private and personal and off limits to any kind of public opinion. Honestly, I don’t believe partners care, and if they did, would they really be the kind of partner that you want to share your body with. If you have to be ‘beach ready’ down there, then that also implies that you have to be beach ready in your skin colour, your arms, your tummy, your legs, your feet… which is a concept that women have been fighting against a lot this last couple of years. You need to catch up Wilkinsons! It is good to like how you look, as you are. In fact I would say it is pretty important to like your body as it is. Yes, we can have some fun, dressing it up and indulging in beauty products but let it be a fun, creative activity not a crutch that we can’t do without. Most people are too busy worrying about what people think about their own body to even take notice of yours. How often is spontaneous skinny dipping even an issue? Anyway, what do you think? Is anyone else driven mad by this advert?